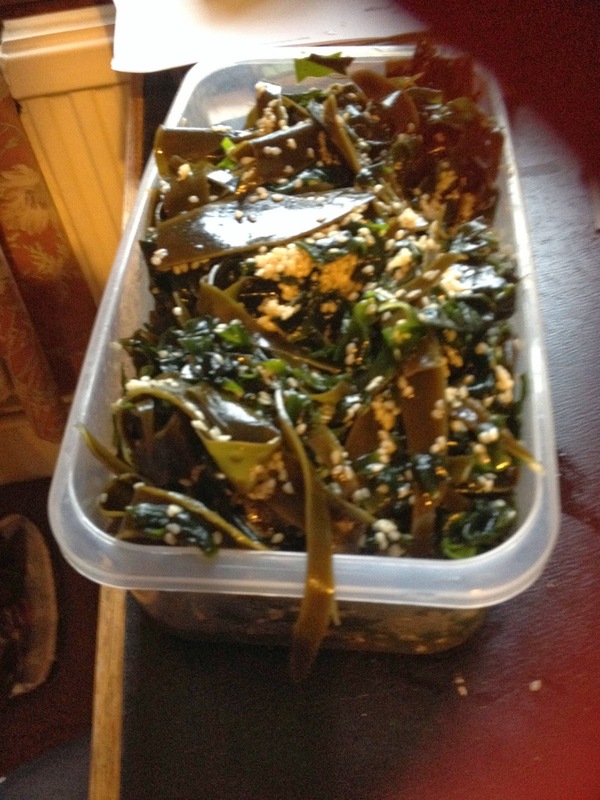 I have recently been spending a small fortune on Seaweed salad from Yo Sushi. In a similar way to the juice addiction I tend to have small time addictions with food where I eat certain things for months on end, every day at some time or other, and then suddenly decide I don’t want them again and stop eating it altogether. Previous fads have gone from the healthy, Pret’s avocado juice, Sainsbury’s melon snack packs, to the unhealthy, curlywurly’s, coconut and vanilla popcorn, to the plain strange, Bird’s custard with cocoa powder to make chocolate custard…. The main issue with the seaweed salad addiction is the fact it costs £2.50 a pop, which as a poor student I immediately knew was unsustainable. So as the juice before it, I am striving to make this at home. The first step was research. 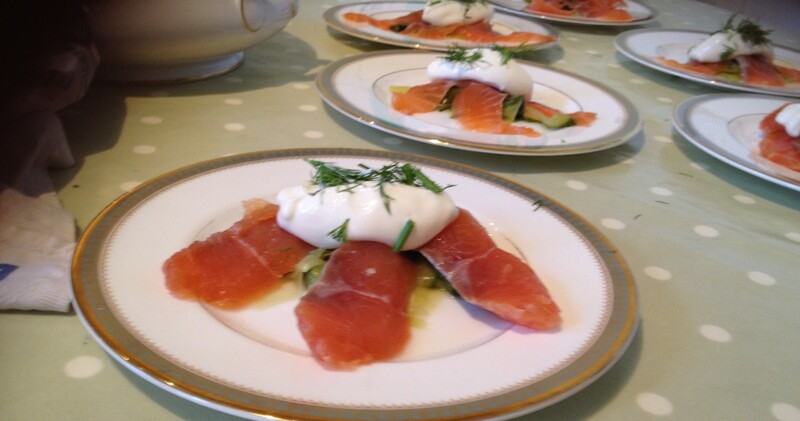 I clocked the list of ingredients in the Yo Sushi version and shaved it down to the basics. As far as I could tell all I needed was; dried seaweed, soy sauce, sugar, rive vinegar, sesame oil and sesame seeds. I took one of those fairly dangerous gambles and ordered my dried seaweed off Amazon and managed to get four hefty bags for about £10 (I’ve used half so far). When they came, they neither looked nor smelt particularly appetising. When shredded and soaked in water they smelt even worse, but I persevered. 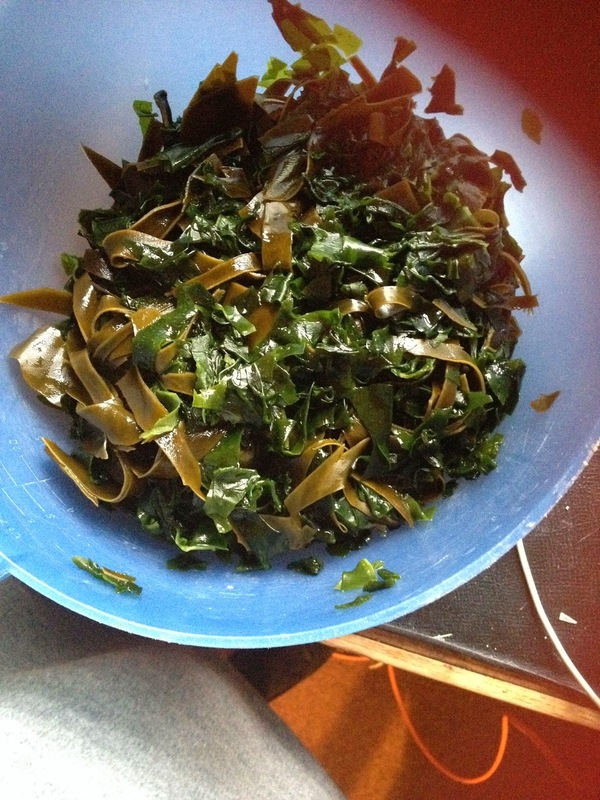 I rinsed the slimy seaweed several times and drained it well. Then I liberally seasoned it with the afore mentioned ingredients (to taste) and I was amazed. Like magic my slimy, smelly seaweed had transformed into a immensely tasty salad, incredibly reminiscent of the Yo Sushi version (although admittedly carrot would have livened up the colour.) In fact the only thing I would do differently was maybe use red Gamma seaweed or something instead of Konbu as it was a little more chewy than I expected, but otherwise I am feeling possibly a little too proud of my recent procrastination. This entry was posted in Easy, Lighter/Healthy, Recipes, Side Dish, Veggie and tagged Japanese, Seaweed. Bookmark the permalink.